John Brown was ordained in 1967 and has served in urban, suburban and rural parishes in the dioceses of York, Chichester, Southwark, St Andrews and Chelmsford and also on the staff of Chelmsford Cathedral. From 1992 – 2007 he was the Bishop of Chelmsford’s Rural Officer and latterly also unofficially the Diocesan Tourism Officer. John is Vice President of the Rural Community Council of Essex and the Essex Association of Local Councils. He was appointed a Deputy Lieutenant of the County of Essex in September 2007. He has been Chair of CVTA since 2004 and is passionate about the ministry of open church buildings to visitors and tourists. Allan was ordained a Deacon in 2008 and a Priest in 2009 and is currently the Rector of the West Wycombe benefice in Buckinghamshire. He has ministered in rural parishes in Norfolk and in Lincolnshire and was until recently the University Chaplain at the University of Wales Trinity St David in Lampeter. Allan has a long held passion for all aspects of medieval art, architecture and material culture and prior to ordination he pursued postgraduate study in Medieval Studies and History of Art at the University of York. He is an author for the British Academy Project Corpus Vitrearum Medii Aevi and is currently writing a monograph on the medieval stained glass of Nottinghamshire. John is a retired public health dentist with an interest in church buildings and tourism and how the Church uses its buildings to further its Mission. His experience includes: Member of General Synod; Church Buildings Council and chair of its Clocks Conservation Committee; Member Yorkshire Historic Churches Trust, Norfolk Churches Trust, Churches Conservation Trust; Member of West Yorkshire and the Dales DAC and Diocesan Church Tourism Advisory Group; Assistant Lay Chair of Allerton Deanery Synod; Church Warden at Moor Allerton & Shadwell Parish; Author “Representations of St Apollonia in British Churches” in Dental Historian (1996). The bulk of Lesley’s working life has been spent in local government in which she served as the full-time clerk of a very busy parish council in Surrey. During this time she gained much experience in many aspects of local affairs including involvement with the tourism industry. She was also a Board member of the English Rural Housing Trust for 13 years. In addition Lesley has been very involved in youth work throughout her life which has included serving four terms of office as a commissioner in the Guide movement. I’ve been working with churches for over 15 years, primarily in church tourism, opening up and giving a great welcome, training volunteers and creating great interpretation of heritage. I managed Heritage Inspired in Yorkshire for 13 years which worked with nearly 200 churches and was shortlisted for tourism awards and the 7th most visited free attraction in England. 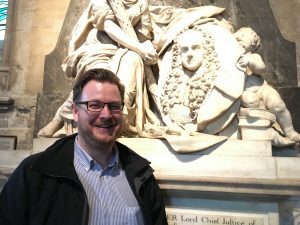 I now work for the National Churches Trust as Church Tourism Manager managing our ever-growing ExploreChurches website: www.explorechurches.org and getting out and about to see which churches should be included in our themed lists, my favourite lists so far are Doctor Who, Beer festivals and Memento mori. Outside work I’m often to be found with my head in a bush looking for a geocache or helping keep the brambles down at York Cemetery. David runs his own company, Great Experience Travel Group, which now has a rapidly developing travel agency and tour operating business. 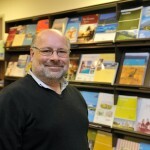 Amongst his other responsibilities, David became the consultant to the Diocese of Oxford on travel & tourism matters, helping to advise the Diocese on the development of strategies for encouraging visitors to come into the many beautiful churches across the Diocese. 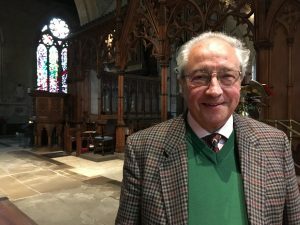 In this role, he was instrumental in setting up and administering the first ever ‘Cotswold Churches Festival’, which has now become an annual event. 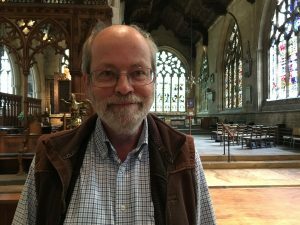 He has recently been asked to help coordinate a Chilterns Churches Festival. 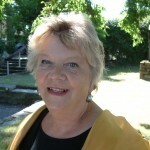 Jo was appointed as Heritage Officer for the Methodist Church in Britain in 2009. Jo is involved in the conservation, development and promotion of Methodist historic buildings, archives and artefact collections. She is passionate about the need to open religious buildings and tell their stories for visitors as part of the Church’s mission. 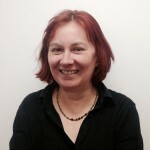 Jo’s role includes liaising with trustee bodies, interpretation and creating exhibitions, publishing in print and online (www.methodistheritage.org.uk and www.mymethodisthistory.org.uk, encouraging and facilitating visits and tours, and helping volunteers increase skills. I am retired teacher of English, Religious Studies, Speech and Drama who was married to a United Reformed Church Minister. In 1988 my late husband was appointed Minister to Saltaire United Reformed Church, an Italianate Victorian edifice in the Mill village of Saltaire on the outskirts of Bradford which is now a World Heritage Site. We receive about 30,000 visitors at the church each year whilst over a million come to the village. Since my husband’s death in 1995 I have remained at the congregation’s request and serve as an Elder and lead worship at local churches. For 15 years I was the URC Ecumenical Officer have served on a number of URC Synod and National Committees and now represent the URC with CVTA. 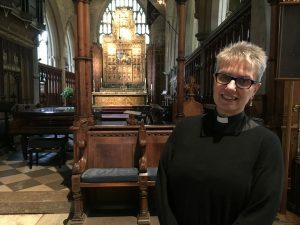 Sue Lucas was ordained deacon in 2008 and priest in 2009 in the Diocese of Liverpool, following a career in teaching and assessment and academic research in philosophy. 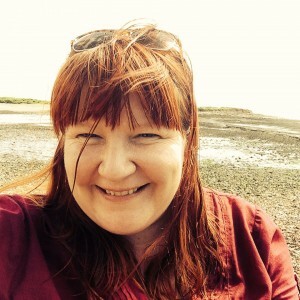 After working in urban contexts in North Liverpool, she had an interim turnaround role in a parish before moving to the Diocese of Chelmsford as Team Rector of East Ham in 2016, a parish that has an 11th century Grade I listed priory church, a 1980s multi purpose church and community centre and a church that is conversion of an early 20th century rectory. Part of her current role involves considering the most effective and sustainable use of these buildings in the mission and ministry of the parish. 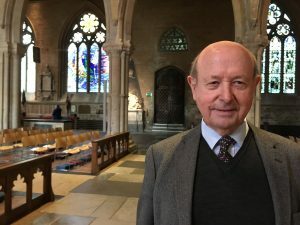 After 40 years in parish ministry both in town and country parishes, Philip has retired to Leicestershire and is active in encouraging open churches, having recently produced a leaflet ‘Discover Leicester’s City Churches’. 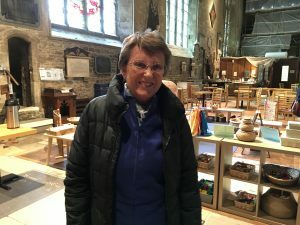 His experience at Spalding in Lincolnshire and at Blakeney, Cley and other parishes in a North Norfolk group has confirmed the value of welcoming visitors, revealing the many opportunities to church people when they commit themselves to a ministry of welcome. Philip has led a number of pilgrimages to Greece, Jordan, Turkey and the Holy Land and encourages people to broaden their spiritual horizons in pilgrimage journeys. Becky Payne was formerly an archaeologist, before spending several years with English Heritage. 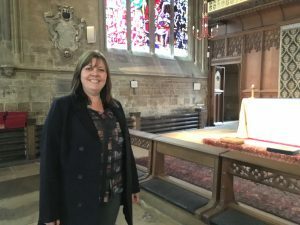 Between 2003 and 2010, she was the Policy Officer in the Church Buildings Division, Church of England promoting and enabling the potential of church buildings as a resource for the whole community. 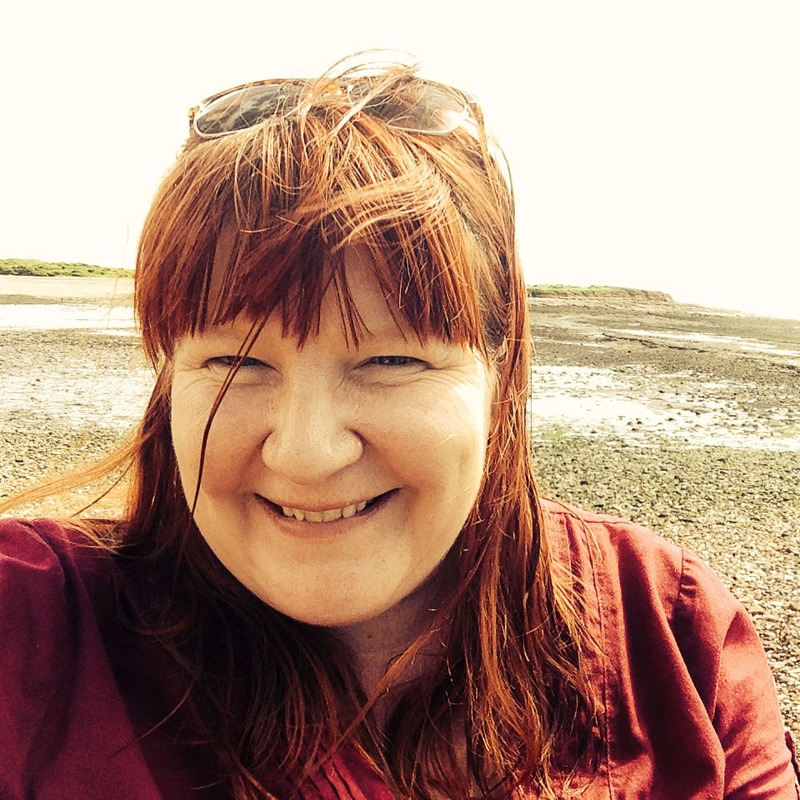 She is now working as a freelance consultant undertaking projects on different aspects of sustaining historic places of worship including church tourism. She is a member of the London Diocesan Advisory Committee. She also volunteers two days a weeks as the Development Officer at the Historic Religious Buildings Alliance at the Heritage Alliance. Since June 2013 Ian has been the Diocese of Liverpool’s Heritage Officer, a position in which he has helped many of the Diocese’s churches secure grant funding for major repair projects. 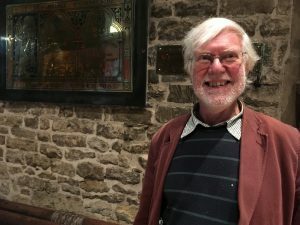 He has run several successful Church Maintenance Training Days and advises churches on everything from welcoming visitors and tourists to eradicating dry rot and Japanese knotweed. In his spare time he enjoys travelling throughout Europe and he is a noted transport photographer whose work has appeared in several publications. He is a Real Ale enthusiast and an active member of the parish church of St Agnes & St Pancras, Toxteth Park. Richard Tulloch has had a long career centred on rural and community development, working for many years in Yorkshire. 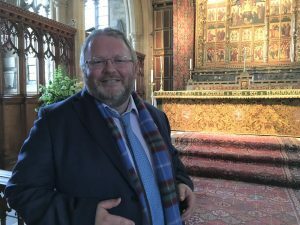 Since 2013, he has worked for the Bath & Wells Diocesan Board of Finance, where he supports parishes wishing to make greater (usually secular) use of their churches, and undertakes tourism functions. These have included producing a popular set of four maps ‘Discover Somerset Churches’ working jointly with a Dunster hotel to run a West Somerset church visiting weekend, and a day trip visiting churches using a 1950 Leyland coach. Away from work, Richard and his family live in a converted village chapel near Salisbury, along with over 30 serotine (very large!) bats.